Jamie Barter has shared a few more of his early photo collection with us. 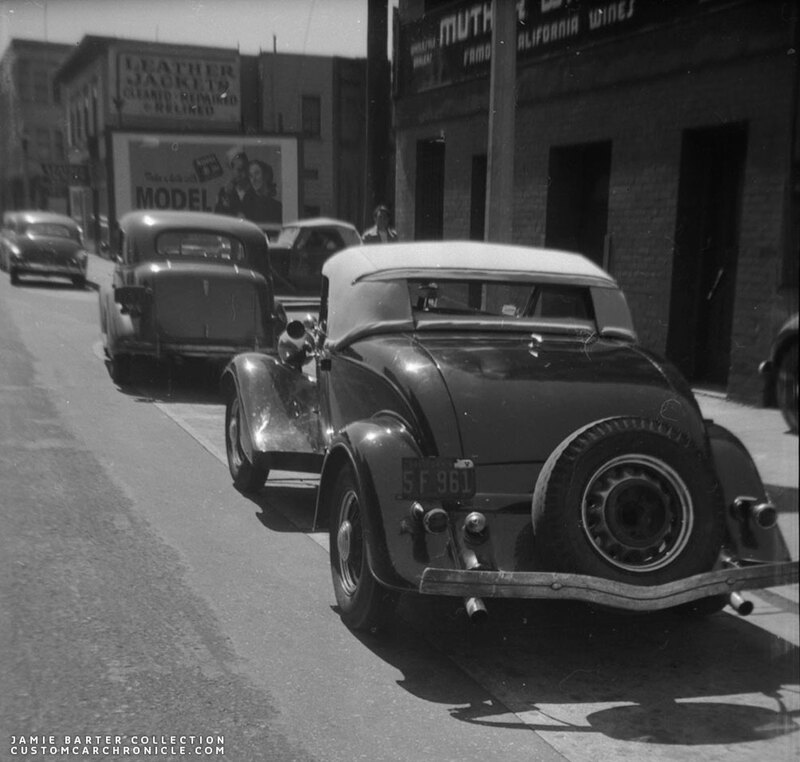 This time a series of photos of a customized 1934 Ford Roadster taken during WWII. 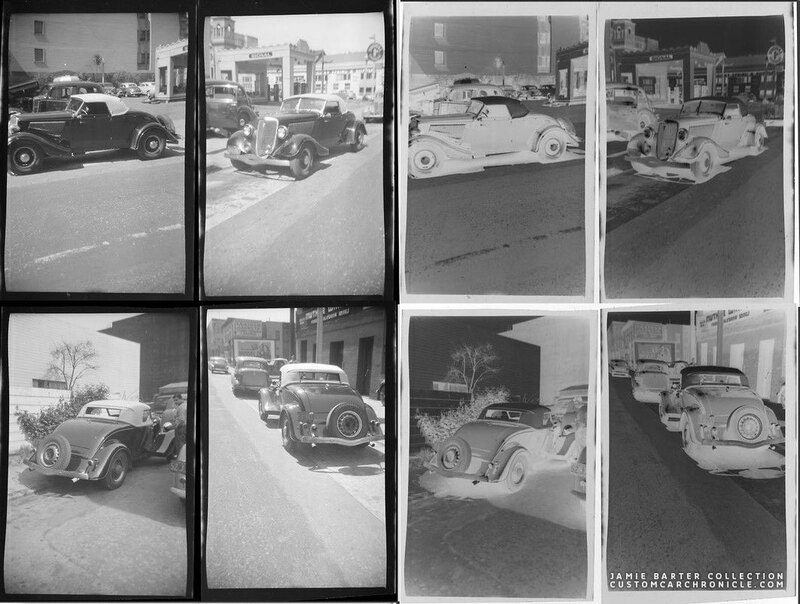 Jamie found these four negatives at an recent (summer 2015) eBay auction. 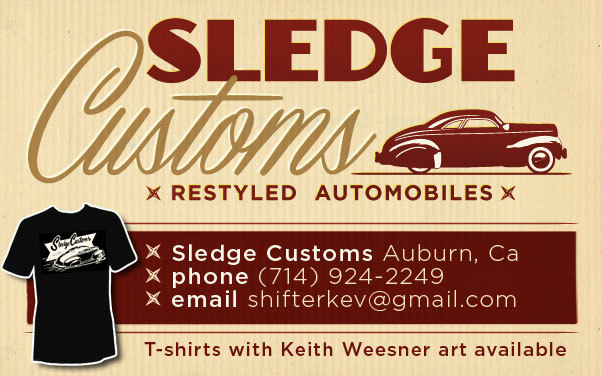 And they show an early customized 1934 Ford Roadster. 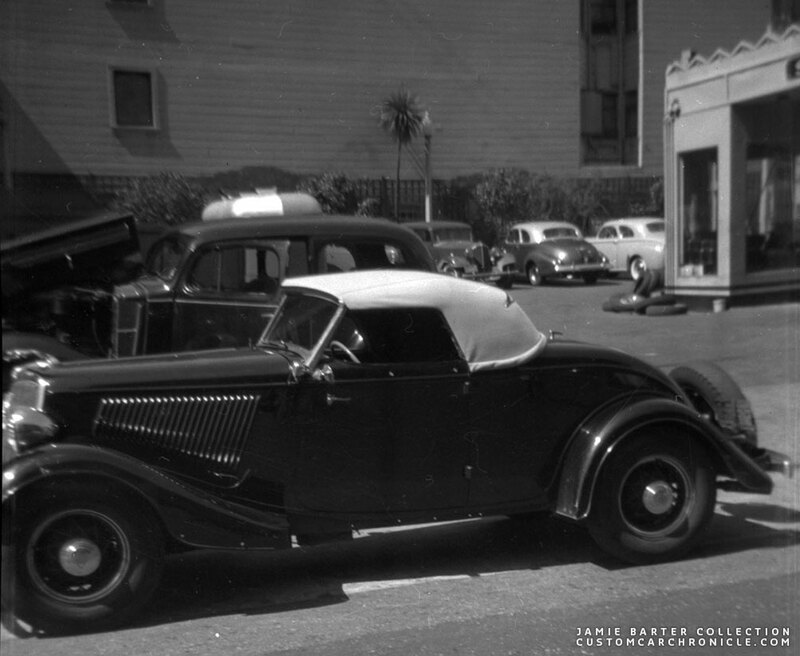 So far Jamie, not anybody else who has seen these photos has been able to identify this nice ’34 Ford Roadster in these photos. So if you know anything about it, please let us know. 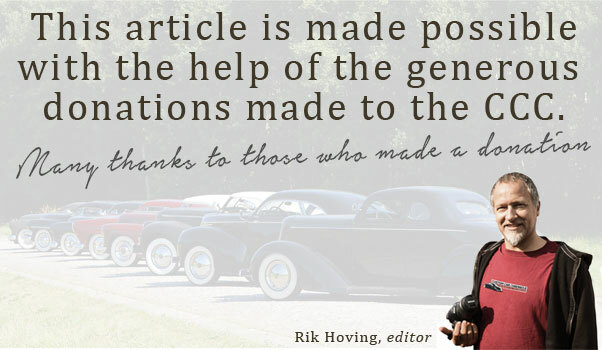 One of the first things you notice on this ’34 Ford Roadster is the V-windhsield. It is hard to tell from these photos if the owner/builder used an v-windshield from another car, or if it was home made to fit the 34 Ford cowl. We do know that it looks really good on the car. The top, possibly a modified soft top to fit the V-windshield, but perhaps it is a custom made padded top, hard to tell. Another Custom touch are the removed running boards and the slightly modified fenders where the running boards used to be. The “double” front bumper is something we have seen before, another real early custom touch. Images from the eBay auction show the original negatives and inverted samples. This side view photo shows the nice rake of the V-windshield and that there was no filler panel made after the running boards were removed. “Double” front bumper, fog lights, and a really great looking V-Windshield. This rear 3/4 view shows that the rear bumper did not have the double up section added. It does show that the passenger side has the custom made side window curtain installed. In this photo we have a good look at the License plate with the “V” tab attached to the upper right of the plate. 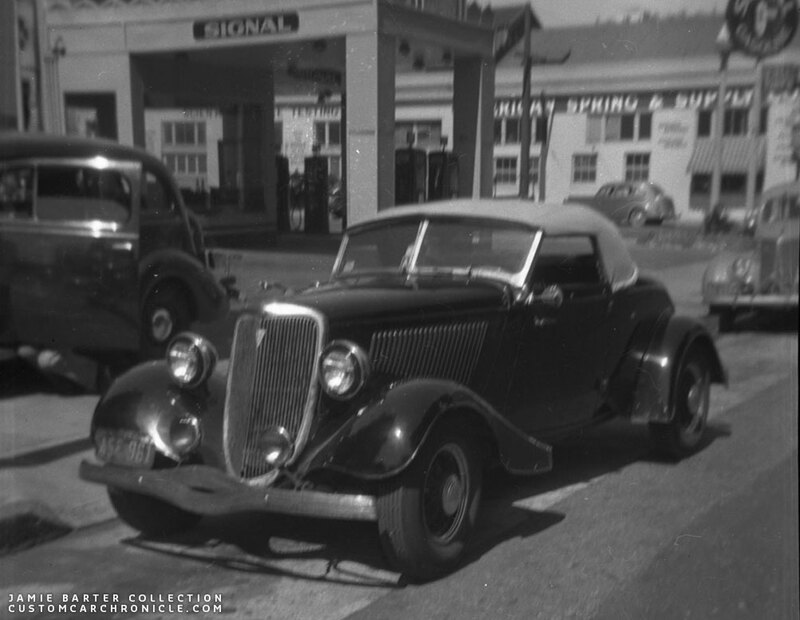 This dates the photos of the car to somewhere between 1941 and 1944. Thank you Jamie for sharing another nice set of early photos, very much appreciated. A nice, perhaps a bit rough around the corners 1934 Ford early Custom. It makes me wonder when it was actually built, possibly even before WWII. 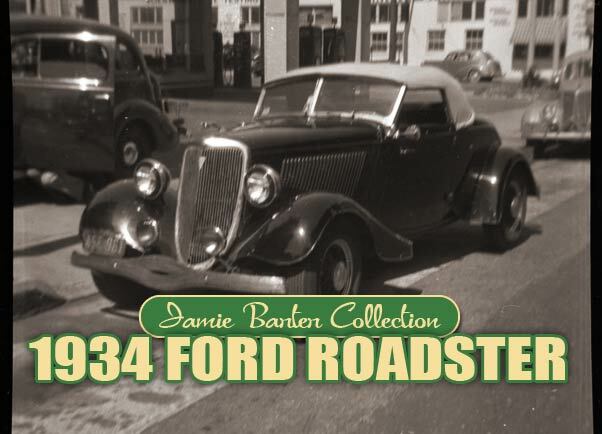 It also makes me wonder what happened to this nice 1934 Ford Roadster. 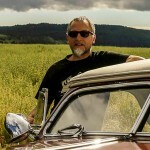 A car with a V-windshield like this but have been noticed. 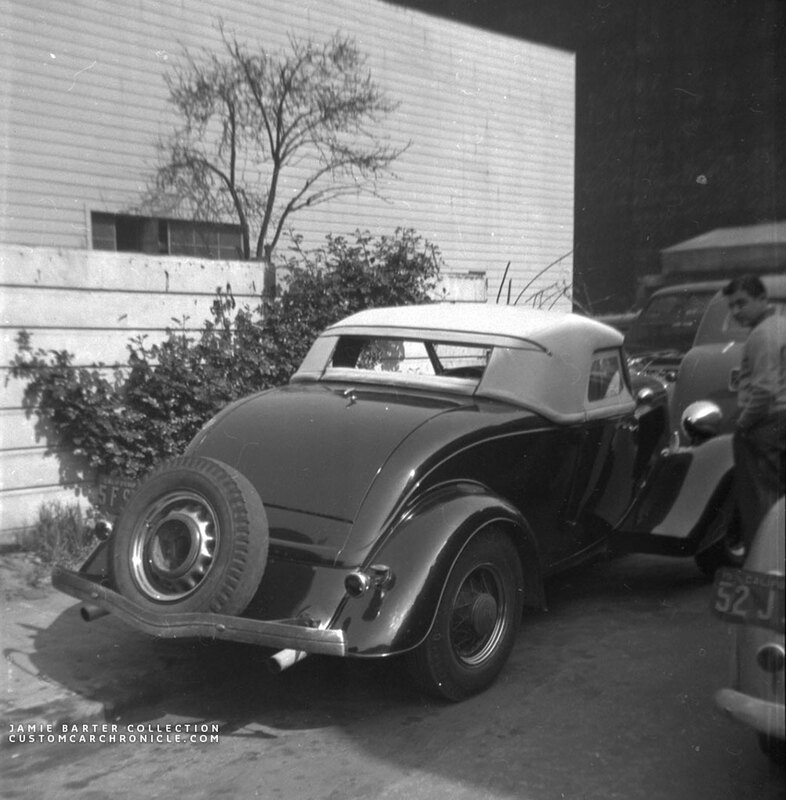 These photos show one again that also the 34 Ford was used back in the early days as Custom Material, and not only for Hot Rodding.